Reader Ed took these photos a couple of days ago in Lancaster County. Let’s just say both these signs would have me doing a double-take. 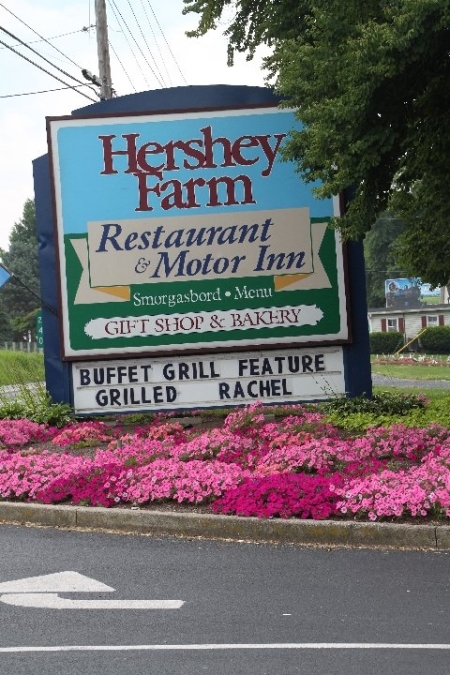 First, Hershey Farm Restaurant & Motor Inn. “Is this the New Amish cuisine?” asks Ed. On to number two. I’m guessing this one is just unfortunate placement. Erik, you’re probably correct about unfortunate placement concerning that second sign. As to the first, it depends on the definition of “grilled”. We can’t know how — or even if — Rachel might have transgressed that she merited such an extreme punishment. However, if she was grilled for information about the Amish, all the inquisitors need have done was subscribe to “Amish America” to get almost all their answers! Well, at the second location, at least they provide customers with options, they don’t necessarily have to buy beer to go with their ice, they can have a nice soda, that would appeal to the tea totters among the Amish and English alike. As for Rachel, I’d rather she be grilled than face the Ban outright..
I’d imagine they get their fair share of comments from customers on the signs. Thinking about the first sign, a grilled Rachel is a Reuben sandwich that is made with turkey and cole slaw or sauerkraut instead of pastrami and sauerkraut. They are quite tasty. 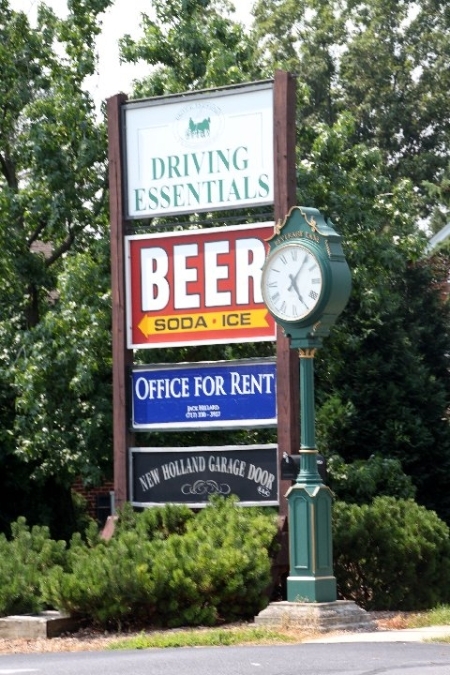 In terms of the second sign, as they say, “It’s five o’clock somewhere,” even if it’s in New Holland…..!! Each to their own tastes, but that’s just plain blasphemy! After seeing this photo I did a little Googling and found there is such a thing as a Grilled Rachel sandwich. I’d assume Rachel has not achieved the fame of her cousin Reuben since I’d never heard of her before. Glad I don’t have internet service at the barn. If my Rachel mare were to read that sign in the photo I think she would be quite, quite disturbed. She IS kind of a stinker and my wife HAS threatened to “skin” her on more than one occasion; most recently in June when I was trimming Rachel’s hooves and she jumped to try to get away from me. She landed right on top of my wife’s right foot and she just stood with her big clod hopper hoof on top of Donnas’ foot until I made her back off. She weighs about 1,650 pounds. Rachel that is, not my wife … she weighs considerable less! After she could walk again she was about ready to skin Rachel over any little infraction. We have never discussed actually GRILLING her though. I think we will pass. BTW: The day Rachel managed to pull this little stunt was the first day of my wife’s retirement. She was not amused. Old Kat, you’ve got me giggling today. Sympathies to the wife. Ever tried a GRILLED RACHEL ? They are delicious……. …especially with fava beans and a nice Chianti, Clarise? I prefer a Monte Cristo, myself. The second photo: “BEER” after the “DRIVING ESSENTIALS” sign would seem to warrant an attorney’s sign below it that says “WE SPECIALIZE IN DUI DEFENSE”. And we see that office happens to be for rent. The perfect third sign. Could also be a funeral home. I love Reuben’s so I have never tried a Rachel. I often see them both offered at various restaurants. I am now waiting for my dinner to get ready, seriously now thanks to you guys I am hungry..
“Reuben and Rachel” is the name of a very old folk song. Several verses. Women sing a verse which is answered by the men. My husband and I did not grow up on farms, so when our Amish egg lady posted this sign, we thought she was probably getting ready to go out of business. “No, no,” she assured us. She had to explain to us that her chickens were no longer laying as well and they were soon to go into the stewpot. A new flock was waiting in the wings, so to speak.